Scary Monsters magazine #64 - The Mummy Turns 75! 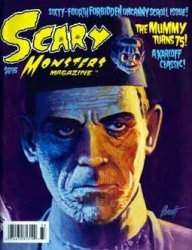 MyMovieMonsters.com > Scary Monsters Magazine > Scary Monsters 1-100 > Scary Monsters magazine #64 - The Mummy Turns 75! Special coverage of the 75th Anniversary of The Mummy - A Karloff Classic! Regular features...and much, much gore! Collectors Note: Brand-new and uncirculated. We'll pick your magazine directly from the printer's carton.